I am struck by what seems to be a lack of masculine energy that is life-giving rather than destructive in our culture. I am also struck by the lack of films that address male individuation. We have plenty of hero myths played out in film but the transformation is external, not internal. The hero changes the world around him by defeating evil but remains unchanged. The recent exception to that may be the latest James Bond film, “Skyfall”, but we suspect that any softening of Bond will mean his demise and the end of a franchise. So it took a woman to write a story of male individuation with a Bond-like character. In contrast, several very good films have portrayed individuation in young women in recent years. Some of these we have presented at our Movie Night at the Evanston Jung Center, such as Black Swan, Winter’s Bone, An Education, True Grit and others. Over the summer Jackie Mattfeld, a board member of the C.G. Jung Center, suggested I view the film “The Hunter” and perhaps present it at the Center. On January 4th we will do just that. In preparation for that I will discuss some aspects of the film here. 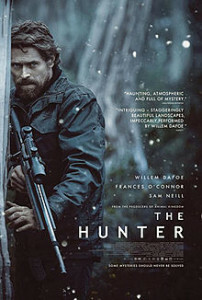 The Hunter is a 2011 Australian film directed by Daniel Nettheim based on the 1999 novel by Julia Leigh. Over the summer I presented a film by Julia Leigh called “Sleeping Beauty”. If that film was about the wounded feminine in our culture, as I think it was, The Hunter is about the wounded masculine and the healing of that woundedness. It stars Willem Dafoe, Sam Neill and Frances O’Connor. Dafoe plays a mercenary, Martin David, who is hired by a biotech weapons manufacturing company to find what is suspected to be the only remaining Tasmanian Tiger. In real life the species has been extinct for decades. In this work of fiction, this rare animal secretes venom that paralyzes its prey and the company, called Red Leaf, wants its organs to extract and research the venom for the development of weapons. The Tasmanian Tiger’s extinction was the direct result of bounty hunting. Once indigenous to mainland Australia the population could not compete with the introduction of the dingo by aborigines and the Tiger settled into the island of Tasmania until the 1930’s when hunters were offered bounties to kill the creatures. Also, the continuing encroachment of humans and the introduction of dogs onto the island may have contributed. The last of this species died in 1932 in a zoo and there is film footage of the animal available on YouTube. Julia Leigh brings this animal back to life for her story and it begins as a symbol of the destructive elements of the dynamic masculine, a destruction only to be repeated if Red Leaf has its way. Martin David is a self-sufficient man caught in the static masculine mode of staying alive, untouched by those around him. He has an artistic nature expressed in his love of classical music which is used throughout the film telling the story of Martin’s transformation using music. Vivaldi’s Winter piece, for example, from Four Seasons is used and you can hear the musical sound of water dripping suggesting the thawing of winter mirroring the thawing of Martin’s rigidity. The Tasmanian landscape becomes a character in this story and is both beautiful and austere, breathtaking in parts of the film yet cold and wet set during winter waiting for the opportunity for spring to emerge just as we anticipate a new self emerging in Martin. The Tiger itself takes on symbolic value as Martin continues his hunt for him. We feel as though the tiger’s qualities resemble those of Martin, a formidable predator, self-sufficient, the last of a dying breed and growing tired of being hunted himself. Martin’s change in stance is very subtle but very profound, an enantiodromia, turning to the opposite realm within his shadow and finding deep and hitherto elusive meaning in his life reaching an emotional crescendo when he finally tracks down the equally elusive tiger. This thawing is helped along by his relationship with the Armstrong family, a mother, Lucy, and two children, Sass and Bike. Martin reluctantly lodges with the family to find out their father has been missing for several months. Martin discovers he too was looking for the tiger and Martin was sent to replace him. Martin develops a bond with the family as the more paternal aspects of his character are drawn out. There is a palpable lack of the positive father from the very beginning of this film, on the personal level with the absence of the Armstrong father but also on the collective level as the memory of the extinction of the Tasmanian Tiger is rekindled and we feel the ramifications of man’s unbridled destructiveness not only with the logging but with the insidious power of Red Leaf, the weapons manufacturer. Jack Mindy is played by Sam Neil and provides a foil for the character of Martin. Mindy by contrast is weak, indecisive, unable to act on his feelings for the Armstrong family, he keeps Lucy drugged up preventing her from moving on in her life. He plays both sides of the fence between the local loggers who do not want researchers in conservation interfering in the logging and keeping men out of work while maintaining friendships with the Armstrong family. His indecisiveness and lack of awareness contribute to the tragic elements in the film. Lucy Armstrong plays her part as well in awakening Martin to a new self and her awakening from a drug induced state in turn was stimulated by Martin who caring nature was drawn out by her and her children. We remember Jung’s inner voice that called out to him documented in his Red Book, a voice he would later attribute to the anima and animus in each of us. This is the voice that many of us hear at midlife and if we are lucky we choose to listen. Please join me on Friday January 4th at 7pm to view and discuss this extraordinary film.